Tesla shareholders will be left with the burden of SolarCity if the motor company's $2.8 billion acquisition is approved, Kynikos President Jim Chanos said today on CNBC. NEW YORK (TheStreet) -- The Tesla Motors (TSLA - Get Report) $2.8 billion all-stock acquisition offer of SolarCity (SCTY) is "shameful," Kynikos Associates President Jim Chanos told CNBC's Scott Wapner on Wednesday's segment of "Fast Money Half Time Report." "The brazen Tesla bailout of SolarCity is a shameful example of the corporate governance at its worst," Chanos argued, who is the founder of Kynikos, a New York City-based firm specializing in short selling stocks. SolarCity, "whose bonds were yielding at 20% yesterday," is heading toward "financial distress," he continued. Tesla shareholders will now have to deal with SolarCity's issue of burning hundreds of millions of dollars each quarter, Chanos noted, predicting that the Palo Alto, CA-based motor company will end up losing $8 billion in the deal. "And if you don't want to believe me, consider this: the combined market drop in the value of both companies is more than the equity value of the deal itself," Chanos stated. 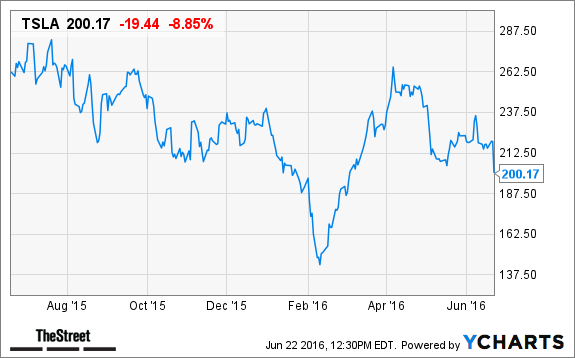 This shows that Tesla shareholders view SolarCity stock as "worthless." Furthermore, Chanos speculated that Tesla CEO Elon Musk had the SolarCity deal in the works when the company sold $2 billion worth of shares a few weeks ago. After Tesla announced its bid to acquire the energy services provider today, in a deal worth between $26.50 and $28.50 per share, several analysts commented that Tesla will see no benefit from the acquisition. Shares of Tesla are plunging by 8.82% to $200.25 this afternoon. Separately, TheStreet Ratings rated Tesla as a "sell" with a score of D+. This is driven by multiple weaknesses, which can be seen in multiple areas, such as its deteriorating net income, generally high debt management risk, disappointing return on equity, weak operating cash flow and generally disappointing historical performance in the stock itself.